Mike Cole has been drawing since he was three years old. He has been displaying his artwork at science fiction conventions across the country for the last 25 years. A word of warning, be afraid, be very afraid. Mike’s art is…well let’s just say it's not your parent’s type of art. He tends to twist his cartoons in ways they really shouldn’t be. Strangely people seem to like this about him. Mike was born in Omaha, NE in 1962 during the week of the Cuban missile crisis. Yes that’s right ladies, he’s 29 years old. He did a 6 year tour in the Marines spending most of his time in California. When he got out, he moved to Illinois, working as a full-time artist for several different companies. Currently he lives in St. Charles, MO in a multi-level comic book storage facility. A science fiction fan since the early 70’s, Mike has attended, volunteered, run, and doomed, (don’t ask) something on the order of 300 conventions. 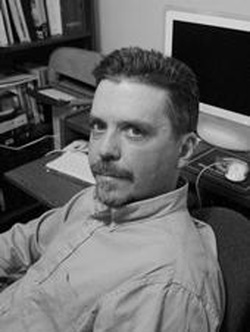 He is a working artist and author of numerous sick and twisted cartoons, as well as creating award winning digital artwork, and covers for Yard Dog Press. He is putting together his seventh collection of cartoons due out in 2012 and has also planned a number of new projects for 2012 including a web comic and a line of pin-up prints.